The egg sac grew in size, and legs started to be visible in a few of the eggs. And then the eggs were separating, with the eggs more visible. They were starting to hatch. The next day, the hatching began. One tiny spiderling broke free and stretched out its long legs, leaving the collapsed white egg shell behind. It was nearly two hours before the next egg hatched, a pair of legs appearing on the other side of the egg sac to the first little spiderling. The next morning, and they were all bursting forth. After 24 hours of holding the bundle of legs and bodies, Mother-cups suddenly started vigorously kicking the spiderlings out of the bundle. Then she decided to leave them to it and go for a wander. She returned, after an hour of peace, and kicked out the remaining few spiderlings. She then dropped the empty egg sac onto the coffee tin below. One little spiderling hadn't hatched. All done! Mother-cups returned to her young and stood guard. That was a week ago. They all hung around together. Then, this morning, after two months in her corner, Mother-cups and all her young were suddenly gone. I found her in the other side of the cupboard. The young have all dispersed. I have at least another dozen females in the living area, many with egg sacs. After few years, and hundreds of young being born in here, I know that we will not be overrun with them. Something is regulating their numbers. Probably sibling-dinners. This is going on in houses all over the world. All you need to do is skip the housework, leave the webs and watch the amazing behaviour of these incredibly docile, harmless creatures. First, I love that you leave her there to live and hatch her young. Second, great series! I hatched a sac of black widows, so I know all about sibling-dinners. You are much more dramatic, hatching black widows! The free entertainment going on around every house in the world, and mostly ignored, is endlessly fascinating. Thank you so much for commenting and letting me know that you have pholcid company. I'd love to know what happens as you watch her. Last year I saw a mommy longlegs with her egg sac in her mouth in my kitchen window frame. I went to get the camera and when I returned, she was gone. Then this year, I found a female in an open container and put lid on to observe. She looked pregnant and I wasn't sure I wanted dozens just like her. But she's been in their for months (I fed and watered her). I knew I had to let her go and read she wouldn't survive outside(I'm in Northwest U.S.) So, after reading your blog, I'm taking off the lid and let her go. Hopefully she'll help get rid of ants. She's not as colorful as your aussie mom. But she's cool and HUGE. Head and body are 2 inches long. Big girl. Thank you so much for this post. I am really keen to hear what happens next in this fascinating saga. More please! I'm glad I found this blog post. I was trying to get an idea of how long to expect our cupboard residents to linger. Love to hear more about your residents! I will be getting back to this blog as soon as the manuscript for my new book is finished. Unfortunately, it has nothing to do with spiders. Can't wait to get back to our eight-legged friends! You can let them be. Most will not survive. You will not be overrun with daddy long-legs. I have let all mine breed all they liked for years and have never had more than half a dozen in the house. I hate to think what happened to all the babies, but I assume they became dinner, and the older ones died. It's a tough life (and often a very short one) being a spider. Any spider who manages to reach maturity and breed is a real survivor! I had a daddy long-legs living in the bathroom. No sign of any egg sac. One day there was another very small spider living in the same web, and the next day there was yet another small spider. Then the second one moved and set up housekeeping behind the toilet. The other two stayed together in the original web, shared a dead bug for a meal. Early this morning they were both there. Now, about 3 hours later there are still two but the smallest one seems to have been replaced by a medium size one! Did it possibly molt? or is this a different spider altogether? What an intriguing scenario! I would love to help, but I have far too little information. Did you take any photos? Was the very small spider a young daddy long-legs? Did the original daddy long-legs share a meal with the smaller spider? If you have photos, then please let me know and we can work out a way to share them Fascinating! Isn't spider watching fun? I don't know if the small one was a small daddy long-legs or not. The bug had been captured last week by the big one, partly eaten I think, then dropped onto the floor. Sunday the smaller one dragged it back up into the web and appeared to be dining. Now it's back on the floor. Then yesterday morning the smaller one either morphed into or was replaced by a medium one. Today what looked mid-size yesterday now looks full sized. Maybe it had molted and hadn't finished stretching into its new exoskeleton? I just have no idea! The other little one is still behind the toilet and is no bigger than it was. A couple weeks ago there were two full size ones living there. One was practically eye-level when you were sitting on the toilet and I didn't think my friends would deal well with that, so I moved him into the back room. Maybe he found his way back and the small spider moved out. It's anybody's guess! Yes, spider watching is fun, and so is watching my friends freak out when they use my bathroom! I have a photo of the original inhabitant, and one of the two when the little one first appeared, but the pictures aren't very good quality. I didn't think to take a picture yesterday when the mid-size appeared. Today they look pretty much identical. I hope they don't mate! I don't think I can deal with dozens of them! Update...little spider behind the toilet has been replaced by a bigger version. The little one was there this morning at 7am. Could the one I moved to the back room have found it's way back? This gets more and more intriguing. Where are you? Can you send any photos you have to lynne @ lynnekelly.com.au (without the spaces)? Thank you so much for the images by email. It all makes sense now. The two spiders I can see easily are a male and female daddy long-legs. The female has the larger abdomen. I can't see the smaller ones clearly, but I would suspect that if they shared food that they are young daddy long-legs. The male will come and go - he’s probably visiting other females around the house which may well be hidden. They leave very fine silk all over the house and know what is going on through that. Don’t worry about an overload of young. You have probably already had them. They will disperse to get away from each other or they become sibling stew. I have had a dozen of so females throughout my house over a number of years but despite them all breeding, the total number never changed much. I can only conclude they ate each other as there was nothing else which would have been a threat. Thank you so much for such fun! Most of the babies won't survive. I had about six adults in the kitchen when these photos were taken. The number never really increased over a few years. They will eat each other if it's crowded, sad to say. I had hundreds of young hatch over the summer but the total number stayed about the same. I'd suggest that you just enjoy them! Wow.. I have just found a mom woth about 25 babies in my sons closet.. She has been tending to all the babies.. My first reaction was to dust them away but I couldn't.. Can we live among these 25 babies or am I crasy?? Will they go into all my childrens things?? I have phot os but not sure how to post. What a great story. Sorry it has taken me so long to reply. I've just had a book come out and it has been very busy. But I really love hearing stories such as this. You describe it so well. I am assuming the guarding spider is also a daddy long-legs. I have seen them cohabit a lot, but I can't remember a male staying around when the female has an egg sac or young. I love the way you see it as a soap opera. That's exactly what I think about my daddy long-legs. They are so great to watch. I am afraid that I have no idea why the guarder is staying there. Can you update me on what happens next? This is intriguing. If you think tiny creatures a minute fraction of your size are a worry, then I am not sure I trust your judgement that we are nuts! Killing defences harmless creatures out of fear is an irrational response. Sad. Lynne - I'm so glad to have found your post! My 4 year old found a daddy long legs in his room a little over a week ago. He was so excited and ran to tell me that the big spider in his room had caught tons of bugs to eat. We went to investigate and discovered he had a mama and her babies camped out in his room. It's been really fun to watch the babies grow and slowly move out of the corner and venture around. The mama had been standing guard but has disappeared as of 2 days ago. My little guy is sad and thinks she left to die. Do you know if this usually happens? It sounded like yours was still alive. We discovered today there is a web super highway all around the top of my sons room. Did the mama spider make this super highway? We sure are having fun watching the little babies try to figure out where to go. And we are hoping to find another mama to watch. What a fantastic story. Love it! My Mummy long-legs left the cupboard after having the babies and moved elsewhere. I managed to keep track of the various females a bit just by checking constantly who was still in the same web and who had moved. They do move around more than some of the other web builders. Yes, I suspect she was responsible for the superhighway - great term - there will be a great deal more that you can't see until it gets old and dirty. It is how they detect food even if it is a long way from where they are resting. One arachnologist told me that the leave fine silk trails all over the house and so will move to where they detect food. Time for you and your 4 year old to start hunting the house and see where she has moved to. Or find another one and say it is the mama. It is most likely that it will be her. I have had them change rooms in the course of a day. Hi Lynne, I won't lie I have a fear of spiders but I have learnt to live with them or evict them if I can't (I never harm them). Around 2 weeks ago I found a rather large long legs in my walk in cupboard where my cats eat. It was have a good look around until it found a corner it must have decided it liked. 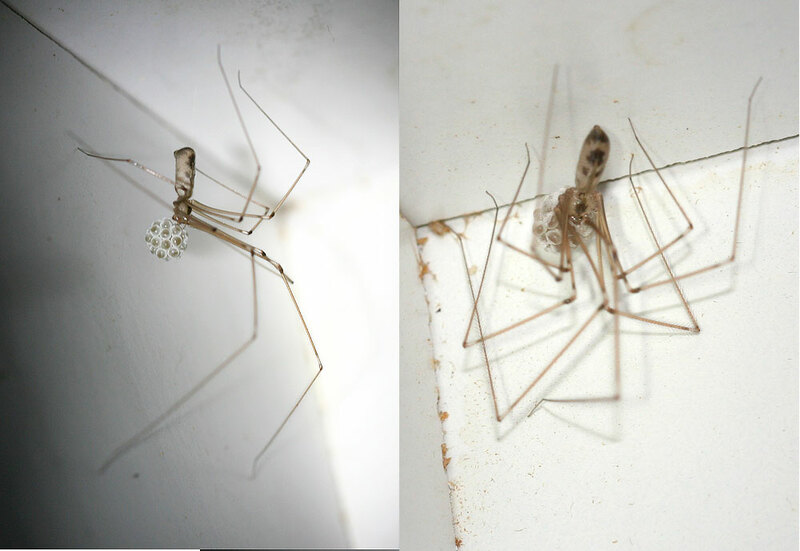 A couple of days later I noticed the long legs was holding a sac & knew then that she was a mummy long legs. Every night when I've been in to feed the cats I've checked on her to see if she was still hanging around & she was, always in the same corner as the sac grew. 2 nights ago she started kicking up a fuss & it made me wonder if the little legs where hatching. Last night as I went in to check I noticed the sac had gone & there are lots of tiny brown spots on the ceiling, mummy legs is hovering over them upside down. It got me wondering if these creatures protect their young for a while after they've hatched so I decided to investigate which is when I found your blog. It was very interesting to read & now I know to expect them to move on soon. I thought you might be interested to read this. Thank you for the story. Thank you so much for writing. This is such a gorgeous story and I enjoyed it immensely. Love the term "little legs". I'll pinch that! Your story has reminded me how much I enjoy watching spiders. I have been so obsessed with my academic research and books, that I have had too little time for my eight-legged friends. Now that my new book is out, I have less pressure on my time - just as spring has come here in Australia. The spiders will soon be out and about and I will be out and about with them. I just found your blog. I have a whole bunch of daddy long legs, but now I also have babies. I don't know what to expect and cannot find any info. I don't want to harm them, but I also don't want the spider population to explode. I currently have 10 adults in the living room. I also had one or two in the bathroom and the hallway, but they seem to be gone. I take it a lot of the babies will serve as food? I really don't need hundreds of daddy long legs in the house. Any advice Would be appreciated. Thank you! I have had hundreds of babies born in my house and never moved them. The population never grew. I suspect they ate sibling stew. Expect that you will have the same experience and not end up with hundreds. I'd love to hear how it goes! Ja, sadly all but three are gone. Oh well, the circle of life (and death)... Every morning I noticed there were fewer. It was interesting, though. Fascinating. I'd love to hear your updates in future if you continue to share your house with them, Tiger. My favourite at the moment is Violet - she lives under a shelf with African Violets on it in the bathroom. She is at least 18 months old and has bred, but there is only her in the bathroom now. She does have regular male visitors. I dread the day I find her dead, I've got so used to her being there. But she is an old spider now. Thank you for the update. A lot happens once you start spider watching! I look forward to hearing more. Things are quiet here being mid-winter. Violet seems to be my only daddy long-legs although I had about a dozen in summer. I assume there are mroe somewhere that I haven't noticed them. You don't need TV anymore! Fascinating, aren't they? I have none - it is still winter. I am hoping that my female, Violet, who has now been in the same location in the bathroom for over 18 months, will breed. I will miss her when she goes. I have never had one so stationery for so long before. She has bred twice but there are no sign of her young. Keep me up to date, won't you! Ja, now I have one more batch of babies and one highly pregnant spider. I am hoping to catch it when one gives birth, but so far no luck. I think they wait till I go to bed, how rude! And they don't like to clean apparently. They mess up their homes and move, leaving the uncleaned webs behind. Gee, what it that going to do to their property values?? The new mommy is currently expanding her home, though. She is super busy webbing. Shouldn't she be watching the babies??? Your report is absolutely delightful! I can't wait for our summer to watch some mroe spider antics. I shall await the next instalment. I had the third batch of babies a couple of weeks ago and they are already gone. I watched mom closely, but missed the big event. Bummer! I think I have one more pregnant one. I also have a few, very few, juveniles of different sizes. But now that I am getting used to it, the excitement has slowed down. Time to find some members of another species. A strong torch and outside, I suspect will be the way forward! I'd still love to hear about your daddy longlegs, though. I have watched the mothers help the babies hatch by kicking the egg sac. Quite a few species of spider help the babies hatch, so I think that is what they are doing. Happy for you to have alternative ideas! I wish we had tarantulas! The day after I stated we just had our last babies, I found more. And I think I still have a couple of pregnant ladies... Oy vey! Lucky you! I am jealous! Thank you for sharing this and all the detailed photos! It's wonderful you still repo d to comments years later on this post. Was super helpful for me and good to know I won't have a spider infestation. Thank you for your comment. I am just getting ready to start blogging on this and my author site again regularly. I have been super busy since my most recent book came out a year ago but I am finally settling down to being at home with my spiders (and husband). I have so many things I want to post here! I have been enjoying reading all above + photos - this AM I was bathing the dog on the deck and had the pleasure of watching a mommy with egg sac,actually pretty leisurely,leaving the flood - I know she got to a dry spot so I suspect she will do fine. I too do not disturb spiders in the house - too much fun to observe...and o yes, I have 10 tarantulas - they are the best pets! You have just described my idea of a perfect morning and home. Thank you! So glad I found this! My husband jokes I'm a bit weird because of my fascination over the spiders that live in our house- I've been tracking a Pholcus Phalangioides with her eggs above our bathroom door since she appeared 13 days ago. I found a female who had already had her young spread out around her not long after, so I've been excited to watch my egg holder's progress. She's currently got the eggs out of her jaws and is spinning them around, which I thought was so neat(I don't know about you, but I often feel like they won't move with me in the room, hah). Thanks for proving I'm not the only one who isn't an entomologist & loves this! I am delighted to meet you! I get enormous pleasure out of my spiders and their dramatic lives lived in miniature. Mine don't tend to move when I am around - they are very capable of detecting us through the movement of the air even if their eyesight isn't great. Jumping spiders will see you and respond, but with Pholcids, it is more likely the movement they detect. But individuals react differently. Have you noticed that? We had company last month...the 8 year old spotted the spiders living in the walk in shower, and knowing his 2 year old brother was terrified of spiders, happily pointed them out! The 2 year old refused to take a shower so I had to get the stepladder and relocate the two daddy long-legs to the back room. Don't know where they're living now! Time to teach the two year old to name spiders and think of them as pets. If possible - easy for me to say, and I don't deal with an 8-year-old mischief maker! Great idea, but unfortunately it wasn't my call! Good morning, Lynne. I'm back! I have something 'new' happening on my ceiling! I noticed small dark spots that eventually disappeared or rather became very light spots to where they are almost invisible. Yesterday and today I noticed activity at two of those spots, one each day. I saw what looked like very small dots and one strand that looks like a spider's web strand hanging down with those little black dots (spiders? Insects?) causing a very large black knot to be visible. I don't know how to explain it. I have pictures but I don't know how to post them here. Any idea what it could be? PS: after watching it for the past couple of hours, I saw several 'knots' form. I kept looking at it while I read something but I did not keep my eyes off it for more than a minute. All of a sudden they were all gone. I did not see them move or leave. WEIRD!! How weird! I have no idea what they are. You are welcome to send me the photos, preferably not too large! My email is lynne @ lynnekelly.com.au without the spaces. I have a bread that hatched, I have been watching her for several months and feed her another house spider. I wish I could keep them. My husband has had it. He is seriously creeped now. How can I relocate without harming the darlings? The best way to relocate is to capture in a jar or glass and cover with cardboard to take outside. But daddy long-legs are very delicate and this isn't always easy. You can try getting her on the end of the broom. You don't need to feed them. They don't need much food and will manage it themselves even when it seems that there is nothing around. My one is on its second batch of babies. But there A ASEXUAL. How is she mating in a glass tank. That is a spider speciality! The females produce eggs but they also store sperm. They can then use stored sperm to fertilise eggs whoever the conditions are right, even if they have used some of that sperm from the last sexual encounter before. I describe a huntsman who did this in captivity in my Spiders book. So it is not asexual, it is just arachnid-specula not mammal-sexual. Hi Lynne, well, I read your post and all the comments and enjoyed reading it so much I figured I should contribute as well! College student in the PNW, noticed a daddy long legs up in a shielded corner of my dorm hallway a month or two ago and decided to let it be because it seemed cozy and settled. Fast forward to a week or two ago, and I became sure that her abdomen was expanding— mommy long legs! Interestingly, a few days after I began to suspect that she was growing in size another long legs appeared in the web that seems to be her mate. I don’t see him leave often, they seem to have a nice cohabitation going on and I have seen them interact by stretching legs here or there but they tend to stop once they notice me. A question— some days the female’s abdomen looks somehow pointier at the tip? What do you think this is explained by? What happens when she wants to get the egg sac out? Does it actually come through her mouth or just she just carry it from her jaws? Interested to see what happens next with this cozy little family, I’m glad I let her stay now that I’ve read all of the stories on your blog! Thank you so much for your comments. One you start watching individuals, your interest will just grow and grow. The egg sac is constructed in the usual way - from her spinnerets on her rear end. The eggs will be placed into it, again from her abdomen. Then she'll pick it up in her jaws. With a good torch, you can see the individual eggs with the naked eye. Amazing to see. I have found the males will come and go if there are other females around. They tend to get on well with the females. I am looking forward to hearing what happens next! I must add more to this blog. 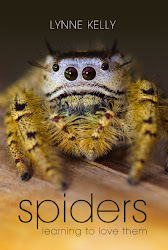 I am so busy with my more recent books and other blog that I don't get a chance, although I am still observing my beloved spiders all the time. So much fun to be had! Thank you for letting me enjoy your story! Hi, thanks for the nice spiderblogging! If you revisit comments on this post, I'm curious what interactions you might have noticed within a 'family'? I've seen the mother chase off a hunting spider (okay, no doubt hoping to eat it, but protecting young is a side effect). It seems a plausible maternal strategy would be to provide food as well, but I don't know if that happens. Have you observed anybody eating each other? In our current ceiling-corner family I'm actually puzzled how they're all managing to grow. I do notice the decrease in number but I don't actually see fratriphagy or see sibling-carcass litter (though those would be small). I saw a gnat blundering around, everybody took a grab at it, but when one baby nabbed it nobody else had the chutzpah to horn in. Our pholcid family is up to I think day 4 or 5, and besides growing they're giving each other more personal space. I hope we can catch the dispersal to see how it goes, I'm guessing it's individuals wandering off but would be interesting if it's a group decision. Pholcid family day 7: babies just about all dispersed. Maybe a dozen left, far out in the suburbs. Can't help thinking Mom's body language looks relieved. Pholcid family day 8: I can hardly believe this. She's carrying an egg sac. There are still a dozen children around the edges who haven't quite left Mom's basement, and she's got eggs in her chelicerae? I have no clue what's going on around here. I guess the strange but mundane explanation would be that a pholcid just can produce eggs this fast, a week after the last ones hatched. Double-size batch in abdomen? But I can't help more wild theories, like is it possible those babies in her web weren't hers, they were her (unknown, invisible) sister's or something? Adopted? Because there is one interesting fact in hindsight, that we never noticed her holding the previous egg sac. Which seems odd, since we do look at her in her corner most days, and today it was not subtle that she seemed weird-shaped in front. (We had wondered if maybe they can set their eggs down instead of holding them.) Which now suggests the possibility that maybe this visible one is _her_ first. Leaving that passel of babies to be explained. I guess until constructing something more plausible I have to go with (1a), but huh. Strange stuff. An intersting observation and I can't give an answer on what happened. Time to watch closely over time and see if you can solve the mystery. What wonderful free entertainment! Thank you so much for your comments. I really want to get back to spiderblogging now that I have submitted my new manuscript to my publisher. The three books since "Spiders" have been very demanding, but spiders are still my great love! I do think that the mother protects the young until they shed their first skin, and then they are on their own. I have noticed this with my blackhouse (Australian) and America (introduced) house spiders as well. Then they wait for the right weather and disperse. Inside the house (only the daddy long-legs) there never seems to be an increase in population over time, so something (maybe siblings) are eating them. The young can't feed before they shed their first skin. I don't think daddy long-legs feed communally, although I have witnessed it with the American house spider (Parasteatoda tepidariorum) whose young stay around a lot longer. I have found them everywhere - but they are often pale and so you see the messy webs but don't realise they are inhabited. Parasteatoda are wonderful to watch - they do so much out in the open! I've never observed babies eating each other, but the arachnologists report that it happens. I have never seen the babies eat anything so am intrigued by your report. Wonderful! I have rarely seen where they have dispersed to in the house. They are so delicate as babies. Occasionally I'll see one and hope that it grows. Love your observation of a relieved mother! I'd love to hear more of your observations. Strange observation attached on to the previous! Oh that's interesting, they molt before they eat? We wondered how they are all gaining visible body size when it doesn't seem possible they can all have been catching prey. Maybe actually it's the same innards in a bigger and more opaque skin. We did see one catch a small insect but can't confirm it actually ate it. The offspring have lost numbers one way or another, but some are visible setting up web in different corners and different rooms. (A species of pholcid, _Crossopriza lyoni_, where they saw that "spiderlings would share a single mosquito or eat a mosquito wrapped by the mother spider". So fascinating. Aren't they wonderful to watch and get to know as individuals? How interesting about them sharing prey. Thank you so much for sharing that. How sad! The only alternative is to collect them in a jar or on a broom and take them outside. The fear is hurting them given those incredibly delicate legs. So sad that most people don't understand the natural world. All the very best with it! I am delighted that you are fascinated. I have often had hoards of baby-long-legs and never had an oversupply. They seem to disappear, probably as food for other spiders including siblings. Enjoy your observing and please let me know what happens. The momma long legs in my bathroom sat with her sac for about 3 weeks before the little ones hatched. They hatched about 2 weeks ago, and they’re all still hanging around. I counted, and all 24 babies are still alive and well, cohabitating with momma. It made me curious: do the babies eat? Momma has eaten a couple small moths and today she caught a crane fly that was quite a bit larger than she was, but the babies don’t seem to take any interest. I am so sorry it took so long for me to notice this comment. Life got over-busy. This is fascinating. The babies won't eat until after their first moult which then leaves them with proper mouth parts. Then they'll disperse or they might eat each other. That's why the babies aren't sharing Momma's food. Let me know what happens. I love people's spider watching stories! A couple days later, they scattered throughout the bathroom and beyond. Now I have a new issue: momma spider keeps taking up residence in my bathtub. I’ve relocated her several times, and she always comes back. Any advice on finding a better spot for her and getting her to stay there? That’s super interesting, by the way, about them not eating until they molt. I would have thought they would have to eat before they molt, like caterpillars, but I guess they’re different critters. Very different critters - but also the variation between spider species is huge. Endless fascination available for anyone wanting to watch spiders! I've been watching this long legs in my bathroom for a couple months seems like. Had the egg for at least a couple weeks and they finally hatched I noticed today. When I was little I used to name all the daddy long legs around "Christian" and Christian would always have babies. We would have about 10 Christian's show had 20 other little Christian's. I was so happy by it all and would never let my mom kill them or move them. Well I was so excited, i was standing on the counter yelling to my boyfriend in the living room, WE HAVE BABIES! But...the babies look like they're all dead?? They are very fuzzy looking and are not dark or moving at all. Mom is still around. Looked like she was leaving when I came in tonight to check on her but she quickly went back over by her babies when I walked in. Is it possible they are alive looking like this? The babies won't move much until they moult and shed their first skins. They can't eat or do anything until then. I suspect that they are still alive. Keep watching! Thank you for the story. Enjoy your spider-watching.